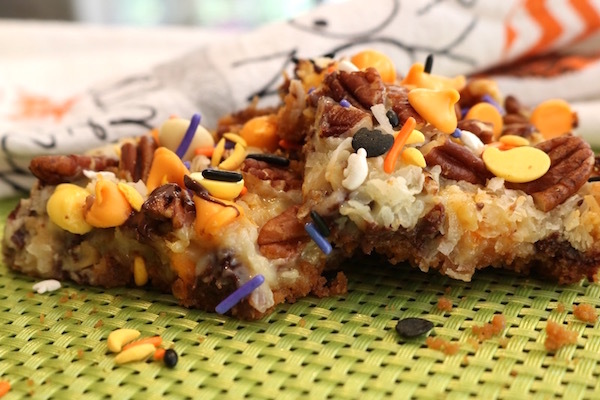 These yummy Halloween Magic Cookie Bars are dressed to impress! This is one of my all time favorite go to dessert recipes. 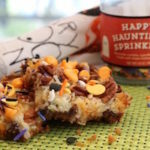 Halloween Magic Cookie Bars is a twist on the original Magic Cookie Bars. It never fails , but when I make these someone always falls in love and has to have the recipe. As much as I want to claim it as my own, I usually give up the recipe. In fact Brody and I made a batch for his friends dad. 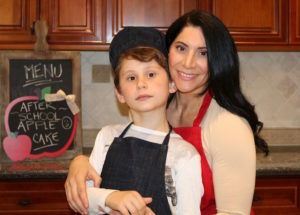 He said he keeps them in his freezer, and has one…..or 2 when he gets a sweet craving. The colored chips can be a challenge to find, but I did find them on amazon. 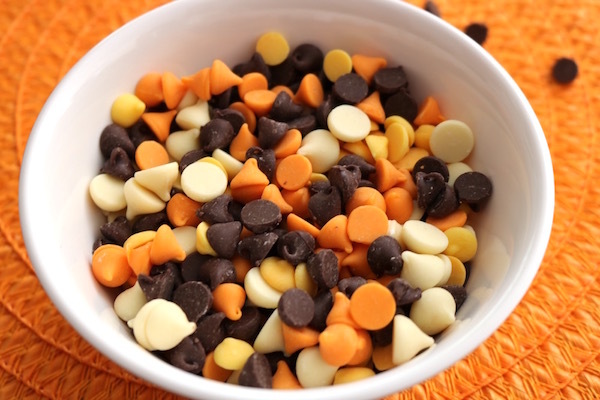 They’re the Nestle Toll House Halloween Morsels, which come with the orange and semi-sweet chips in the package. You will also need the white chocolate chips. I used the yellow chips (I made them) in this recipe as well, but I will not use them next time. 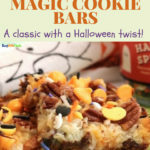 The bars turned out a little on the sweet side, so I suggest using more of the chocolate to make the cookie bars. Adding the sprinkles to the top really makes them look festive for Halloween. This is baked, as you can see the edges are browned. Also, I added a few more of the colored morsels to the top to add color. I think adding the extra is what made it so sweet, and again add the sprinkles for color. The original recipe calls for walnuts, but I love pecans and wanted to change up the flavor a bit. Pecans remind me of the Fall months, so it’s nice to change it up. Wow, it was so worth the change! I love these sprinkles! They have little bats, ghosts, and a variety of colored sprinkles in the bottle. 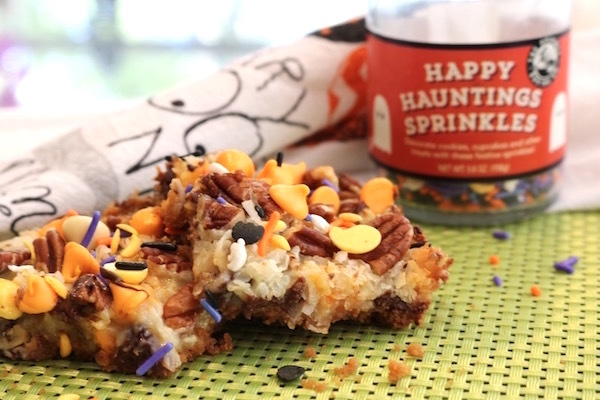 You can do so much with these yummy Halloween Magic Cookie Bars. 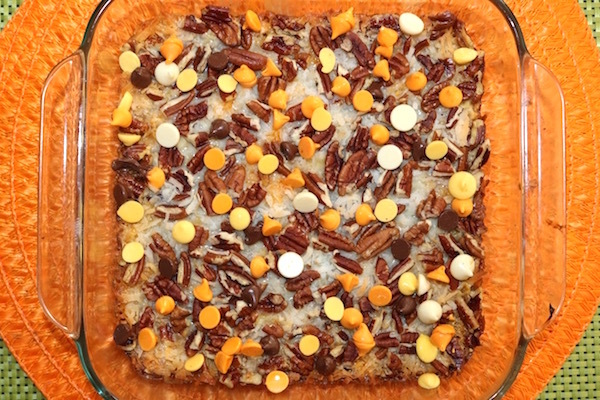 Just get creative, and add your favorite toppings. Combine graham cracker crumbs and butter. Press into bottom of prepared pan. Pour sweetened condensed milk evenly over crumb mixture. Layer evenly adding chocolate chips first, then coconut and nuts. Press down firmly with a fork. Here you can add a few more colored morsels to the top for color. 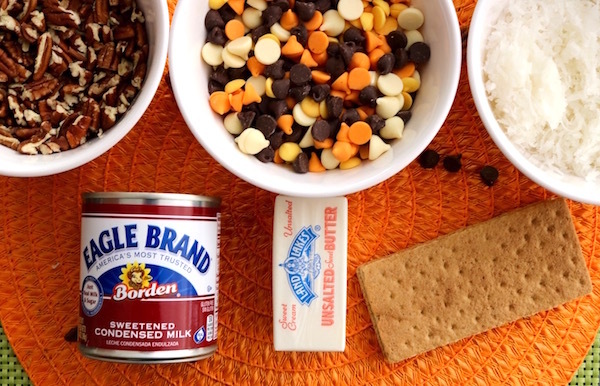 Sprinkle the top with the Halloween sprinkles. Cool, and cut into bars. The bars tend to get very sweet with the white, and color morsels. I've added more semi-sweet chocolate to balance the sweetness. Click here to get this product from Amazon.